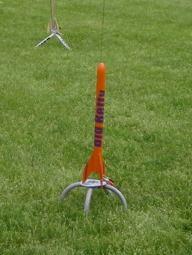 A rocket that can fly on small athletic fields and can be viewed in all aspects of flight. In other words, no Alphas, Wizards, or Vikings. I ended up selecting 3 rockets that fit these criteria. 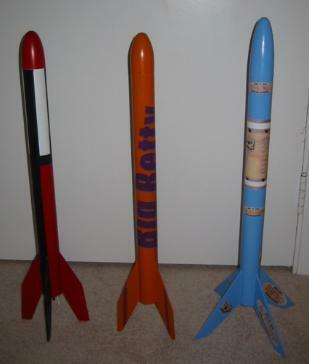 The Estes Big Bertha, the Quest Big Betty, and the Fliskits Rhino. Click Here for the Comparison Article. The Big Betty is a pretty simple build. The only trick to the Big Betty is also a positive: construction of the motor mount with the Kevlar recovery system attached. There is also an engine hook, although not as beefy as the Estes type. The motor mount is not as long as the Big Bertha motor mount, but it fits nicely into the Quest BT-60 body tube. The Big Betty only has 3 fins, shaped very similar to the Big Bertha design. I simply shaped the fins and then rounded the edges. Using the double glue method, they are easy to attach. I added fillets to the fins, then worked on the parachute (attached shroud lines), and then attached the nose cone. Now I was ready for finishing. Finishing was done with primer and Fill-N-Finish. After all was said and done, I gave it a couple coats of orange, and then put on the self-stick decals. The body wrap "Big Betty" actually went on easily. The self-stick decals for the fins are difficult, because after sanding the fins may be slightly shorter than the actual decal. The decals may require a little trimming. On my rocket, the decals are starting to peel off the fins. This is usually my experience with self-stick decals. I think the Big Betty puts in a higher performance than the Big Bertha. It, too, is a very stable design and is easy to see in all aspects of flight. Since the body tube is nice and wide, young racketeers have less conflicts in prepping the bird for flight. Due to its lighter weight (nose cone is light, centering rings are thin, motor mount is not as long as the Big Bertha), it is a higher flyer than the Big Bertha. My first BAR kit. A great first kit. Easy to build, and a reliable performer. I masked the white body tube where the decal was to go, and painted the rest Rust-Oleum Sunburst Yellow. Looked great. I flew this rocket several times at every launch for about a year. A beautiful flight every time until I lost it. I just built another one. Look out Estes! Quest is catching up- or already has- in quality and value. When I wrote to Quest to purchase a replacement nose cone for Big Betty, Quest sent an entire Big Betty kit- for free! Now, THAT'S customer service! Quest has made me a long time customer! An excellent review and dead on the money. Betty is a near clone of Big Bertha and I bought one during one of Hobby Lobby's famous half-off sales as a temporary replacement for my lost 24mm Bertha. Having built Betty stock, I must say she'll probably get plenty of use even when we do build a new Bertha. Better still, the latest Betties have a new decal set, which is purple and very eye-catching, especially on a bright yellow background as the new packaging depicts the rocket as painted. It looks marvelous! Better still, it's lighter and less draggy than a Bertha with three thinner fins as opposed to four rather thick ones and it will probably go like mad on a C6. The review was accurate, but I found an additional problem. The nose cone diameter is larger than the body tube diameter, which makes this rocket slightly ugly. The first flight, on a C6-5, was quite fast. I saw the parachute come out. The model drifts quite a bit on the stock parachute, which is now used in my Estes Blue Ninja; the field I fly in is quite small. Great rocket. I launched on a breezy day, and every time it went up straight & true, and came down without a problem. Very easy to build...I am experienced, but I still enjoyed building it. Sturdy rocket....great first time larger rocket. Agree that Quest is starting to catch up with the other guys. Review is right on. A great rocket for the low price. I set mine up with a 24mm D mount & it flies awesome! It soars straight as an arrow & recovers great on a 12" chute.